It’s a rare event these days, three quarters of the way through the semester, when I have time to cook a meal, let alone photograph it or write about it. Do I have time tonight? No. But after 5 1/2 hours of work, 2 1/2 hours of food service & management, 3 hours of biostatistics, and 3 cumulative hours of subway riding, you couldn’t pay me to do anything “productive” right now! I’d rather think about vegetables. Recently we were lucky enough to inherit, once again, our friends’ share of CSA farm veggies for the week. A slew of beautiful root vegetables – turnips, sweet potatoes, multicolored carrots, onions and leeks, with rosemary and garlic – made of a delicious roasted/slightly charred pile of fall heartiness one night, and the habañeros and cilantro turned into salsa… two ways. 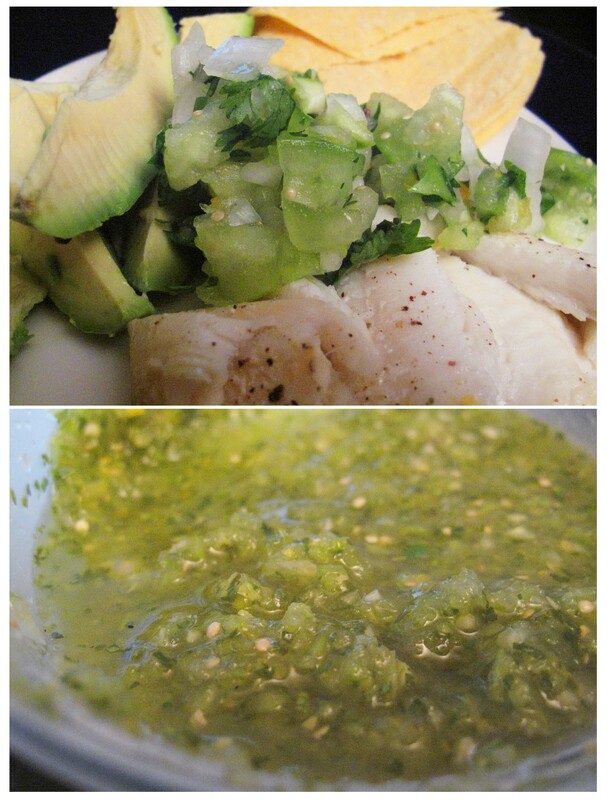 I found some recipes for habañero salsa and ended up combining a few. I took five or six tomatillos, husked and chopped them, and added one habañero (they’re strong! ), a bunch of cilantro, two cloves of garlic, a white onion, fresh squeezed lime and orange juice, orange zest, and salt to taste. We ate the chunky roughly chopped version on top of grilled fish with avocado, and then blended the leftover salsa to a smoother consistency which is good with blue corn chips and will probably be great with some version of huevos rancheros for brunch one day. I’ve actually been putting it on top of almost everything. Who says salsa is for summer? This entry was posted in Cooking adventures and tagged CSA, dinner, farm, sauces, sides, veggies. Bookmark the permalink. Sounds like a great way to jazz up leftover turkey tacos. Happy Thanksgiving.